The Difference is Clear. The Difference is Care. Eye exams are the key to healthy vision and proper eye care. At Malbar Vision Center we consider your total eye health. 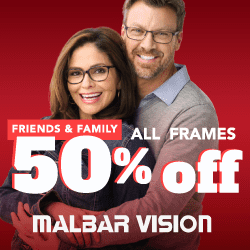 Malbar Vision Centers have been providing quality vision care, optical goods and services, and contact lenses to the Omaha area for over 60 years! We’re Omaha’s most experienced, eye health care team and affordable eyeglass boutique. Customer satisfaction continues to be our #1 priority, and we always want to hear from you. Stop by any of our five convenient Omaha-area locations during our office hours. WITH MALBAR’S SPECIAL OFFERS AND PROMOTIONS YOU CAN GET THE LOOK YOU WANT FOR LESS. Malbar makes it easy for you to look great for less. Choosing eyeglasses that make you look great and meets your prescription needs should not be difficult. To see all of our in-store current promotions, click below. Visit us in-store or contact us via phone or email. Take advantage of these great offers today!